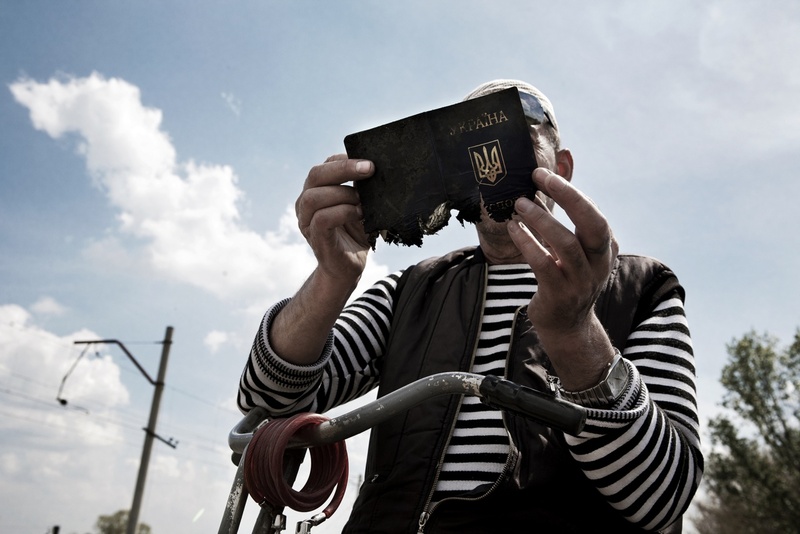 A villager looks a Ukrainian passport lost by the rightful owner and found among the remains of a pro-Russian checkpoint, few hours after the end of a clash between separatists and Ukrainian troops. The document, despite being par tially burned, is fully readable. It belonged to a young man coming from the west, from the ranks of the regular army deployed Ukrainian, probably in the National Guard. 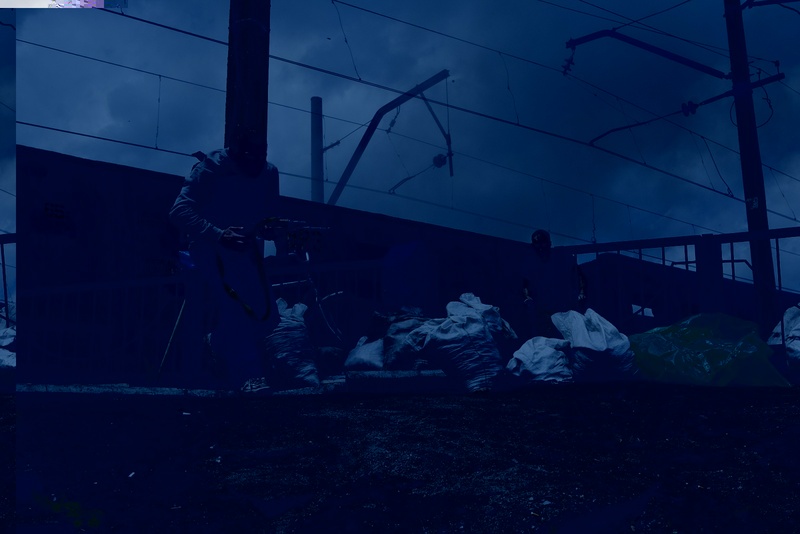 A bomb fired by the regular Ukrainian hits a train used by pro-Russian militants as barricade, near a small village just outside Sloviansk.The checkpoint, now recaptured and under the control of the Ukrainian troops, is located near to Karachun Mount, stronghold of the regular army.  A pro-Russian militant wounded in the legs during a firefight with the regular army, is taken back in your room after medication. Most of the militants of the beginning are young inexperienced and poorly armed and under the guidance of former soldiers of the Soviet or Ukrainian Army, constantly guarding checkpoints. In the centre of the city one of the most important checkpoint is to defend the SBU, the headquarters of the Ukrainian secret service, now occupied by the pro-Russian separatists. When the alarm is triggered the fighters take positions and in few seconds are armed for battle. Some of them have served in the Soviet Army as Juri, in the foreground, a veteran of the war in Afghanistan. 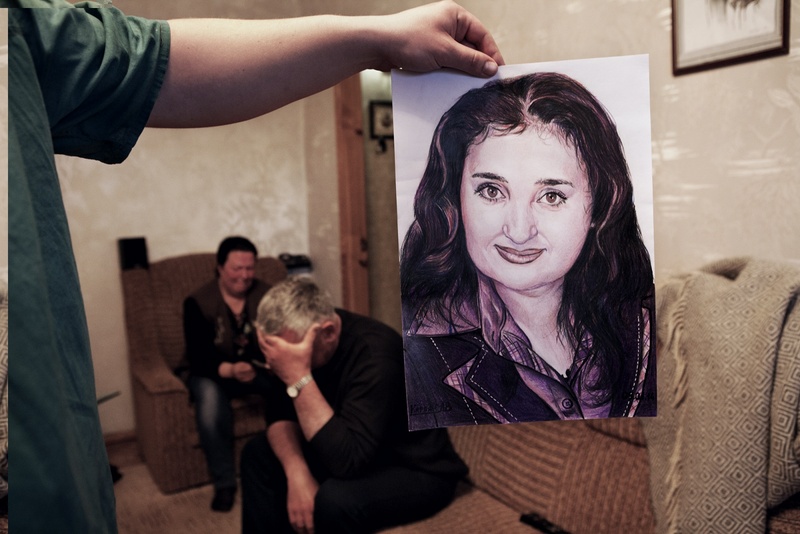 Pavel Pavelco, born in 1972, is one of the three shooting deaths of 20 April. The first day in which there were been three deaths among the separatists. 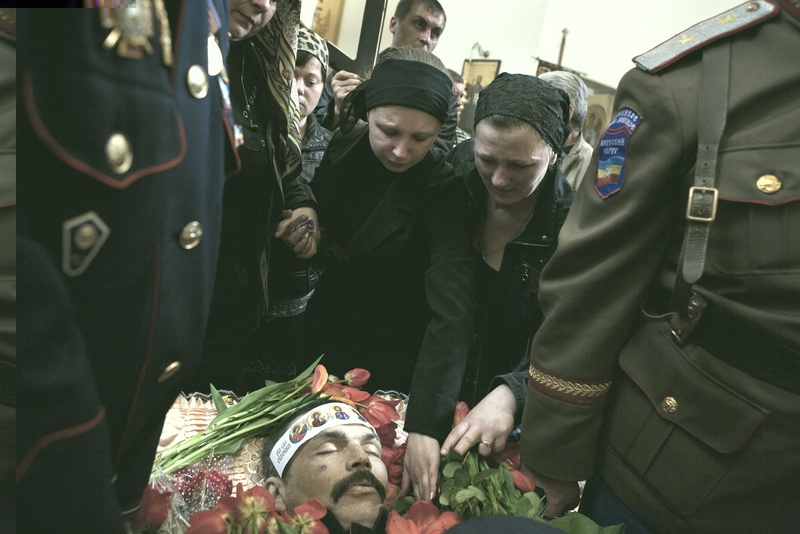 Former Cossack, he has become one of the heroes in the pro-Russian propaganda and his face, as well as that of the other two rebels died, became famous. Their faces were printed on large billboards and exposed in the streets of the city. In the middle of the night, during the fighting near the Karachun Mount, a van load of separatists hurtling at full speed and runs through without stopping, a pro-Russian checkpoint. The soldiers are armed with automatic rifles, RPG launchers and heavy machine guns, all Soviet-made. Some weapons are recent but most have at least 20 years and many are older of the hands that are challenging. 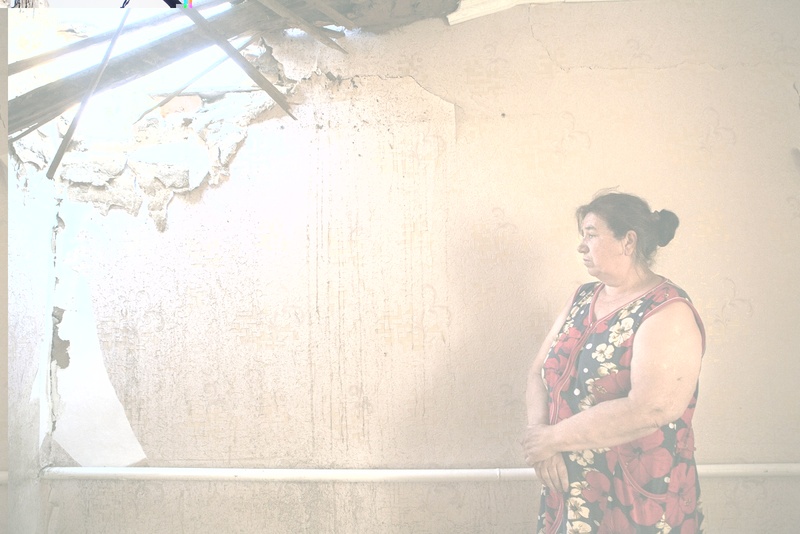 A woman of the small village of Semonovka, injured during the bombing and in shock, is now safety in a small concrete bunker. 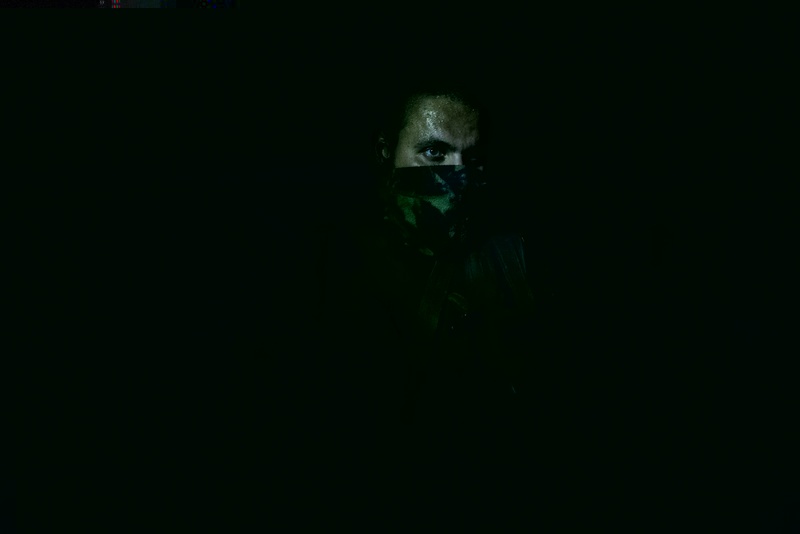 Basement of about 5 meters below the level of the road and a few meters from the fence of the pro-Russian separatists. It is the only place really safe within more than one kilometer but can accommodate no more than eight people. 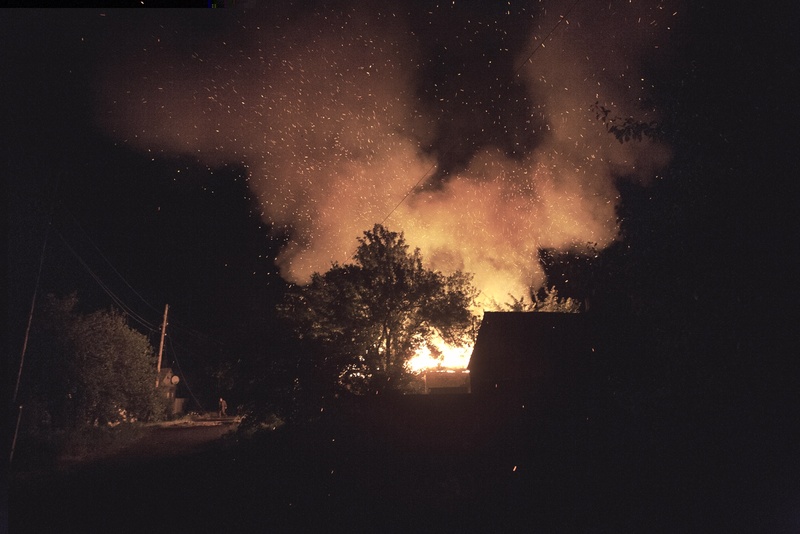 During the night a few mortar rounds hit a small village near Slavyansk.The few remaining residents in that area go away from the flames while some separatists check into their homes the presence of dead and wounded. During the war, there have been numerous houses damaged and hundreds of civilian victims. Boevets Irina, 30, was killed by a gunshot while he was looking out the window, on the balcony of his home. During a shootout curiosity made you leaned over to see what was happening under her palace, but it was achieved by a bullet to the head and died instantly. Gunned down by a sniper, for his family and the media close to the separatist cause; died in mysterious circumstances, probably a stray bullet, for the Government of Kiev. At the checkpoint near the SBU, the most strategic employment of separatist militias in the city, it preparing the weapons for the night. 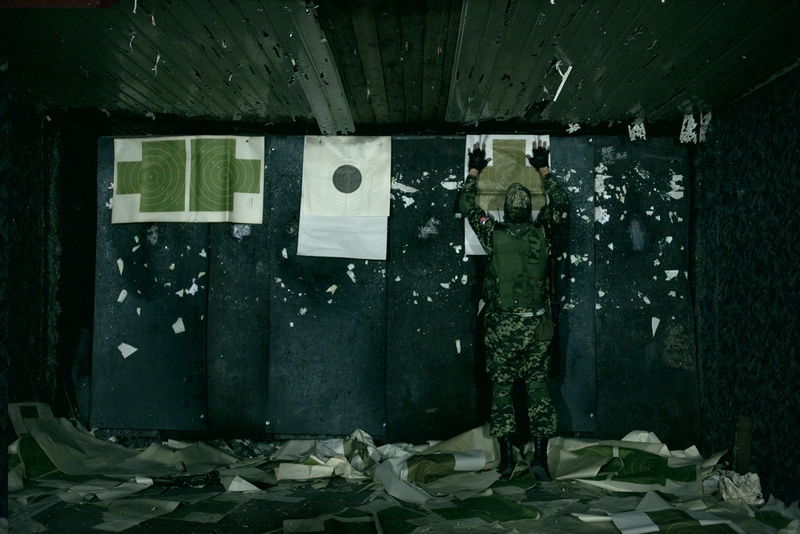 In complete darkness to turn on the lights is prohibited.The spare magazine of Kalashnikov is fixed on the contrary, with adhesive tape, to the grafted, so as to speed up the replacement once finished ammunition. Even some women in the country, although not enrolled, help the militia in small routine matters. 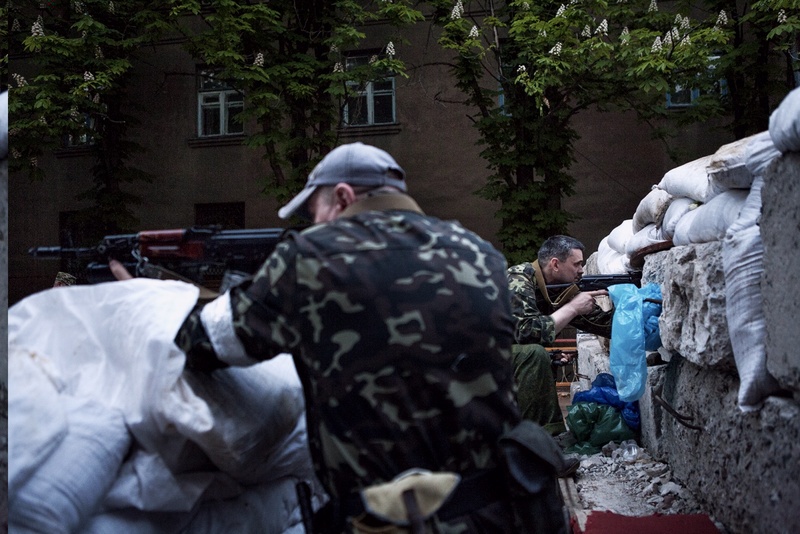 By nightfall it start to fight, in the last outpost before the Ukrainian army position. The bullets bounce off the asphalt, militants take shelter behind the heavy concrete blocks and return fire. 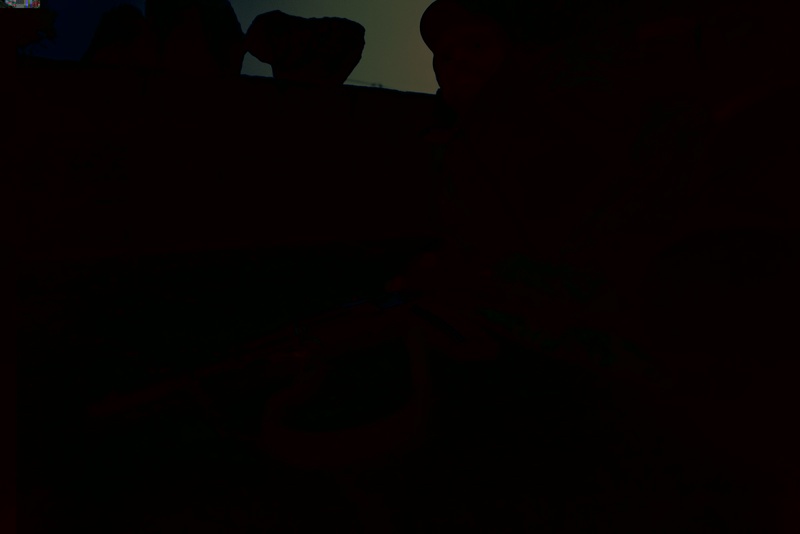 From behind the heavy artillery shelling the enemy that on time responding to the fire.They fight to win Slavyansk. 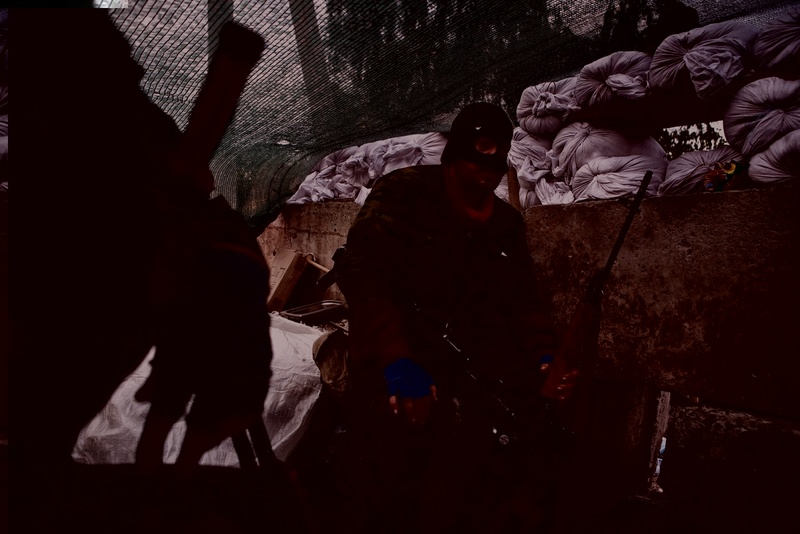 Some separatist militians are preparing for a long night in the trenches last outpost pro-Russian, a few hundred meters from the Ukrainian checkpoint on the road to Karkhov. After countless bombings, grueling rounds and canned food, mates wounded and dead, the moral is always lower and in a few believe that Russia will intervene in their help. At dawn, after yet another night spent in the trenches, some pro-Russian rebels control the homes affected by enemy artillery overnight. They check for the presence of dead or injured, in need of help. During the fighting, with each other’s position perched near homes, often to be affected are civilians and their possessions. Dozens are the homes affected during night bombings and thousands the displace people. The houses, built with different natural materials such as clay, wood and straw, can easily catch fire and quickly wear out. The luckiest are only affected by shrapnel or from loose small mortars, causing damage only partially. In broad daylight a howitzer shot from far Karachun Mount, near Slavyansk, centering a small 24h, a grocery store and tobacco open 24 hours a day. Among the twisted metal the owners recover the goods sold and still carry in their home, to save them from jackals. Miraculously, no one died or was seriously injured. During a night bombing the home of a family has suffered serious damage. 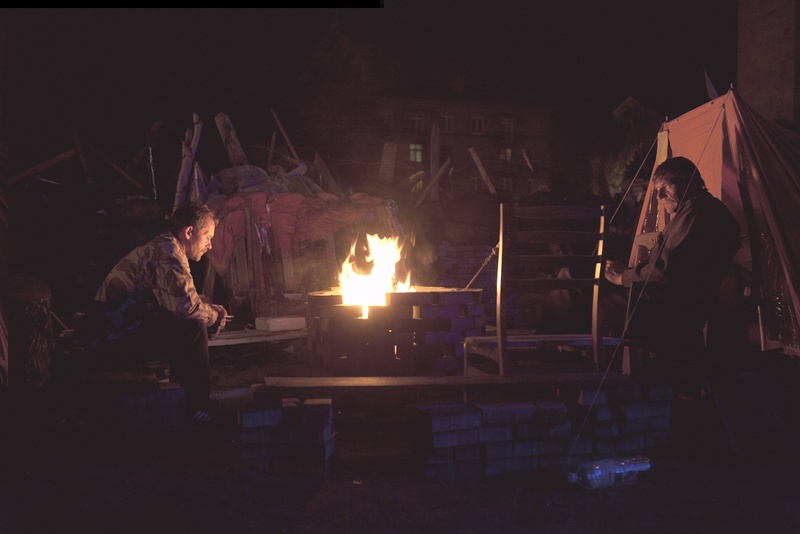 The explosions and fire, however, have graced their laboratory where they deal, for decades, of pottery and ceramics, a craft production widespread and so the Donbass is one of the first manufacturers in the country. 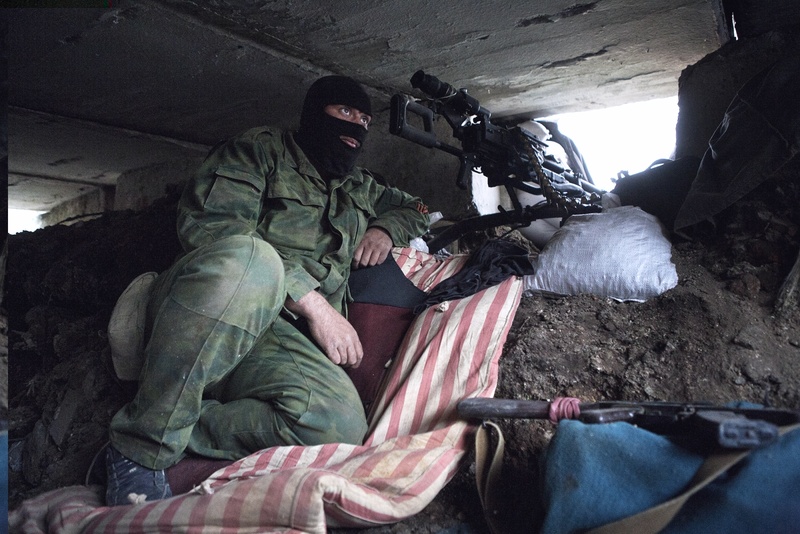 In a trench excavated into the asphalt, next to the barricade of Semonovka, a separatist militant awaits the arrival of the enemy. He is armed with a heavy machine gun and with your inseparabile Kalashnikov, supplied to almost all of the rebels. He is protected by some concrete slabs, single shield during the enemies bombing. 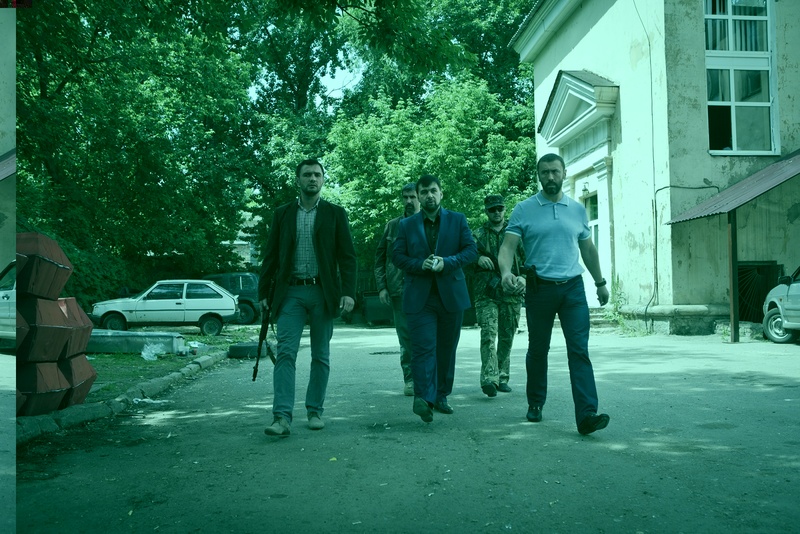 Denis Pushilin, the self-proclaimed governor of the Republic of Donetsk, escorted by his bodyguards. 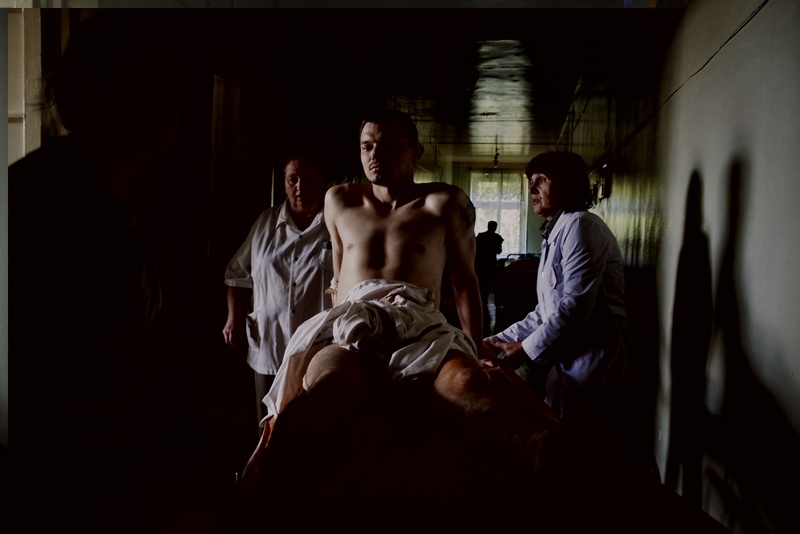 He is leaving the morgue where they were received the bodies of 33 militants of the “Vostok”, a battalion formed mostly by Russian mercenaries and Chechens ossezzi killed in the battle for the liberation of the airport by Ukrainian air force. 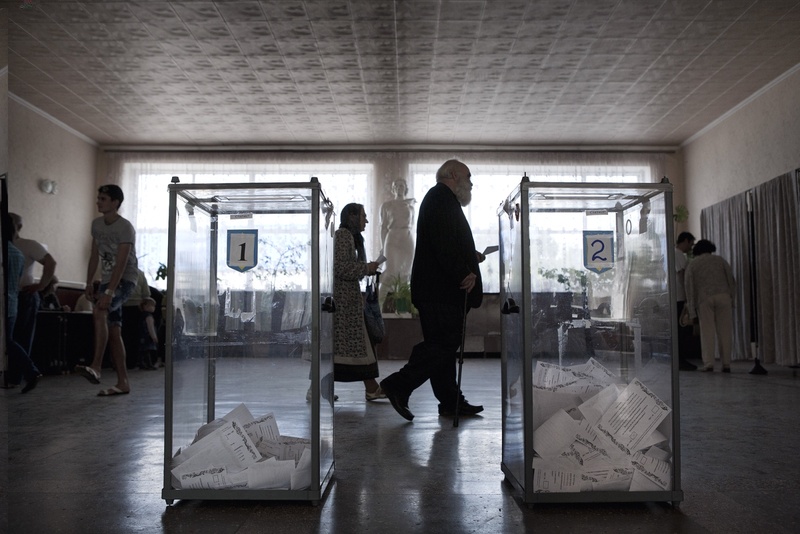 On 11 May 2014,the population of Donbass is invited to vote for a referendum. The text, in two languages, first Russian and then Ukrainian, reads: “Do you agree with the act of independence of the National Republic of Donetsk? If you do not tick any box the vote is null“. On 12 May 2014, a collaborator of the mayor announces the results of the referendum: the “yes” won with a percentage of 97.6 and with a turnout of about 80% of those entitled to vote. The data, however, have not been verified by anyone and the counting took place behind closed doors, as well as counting. 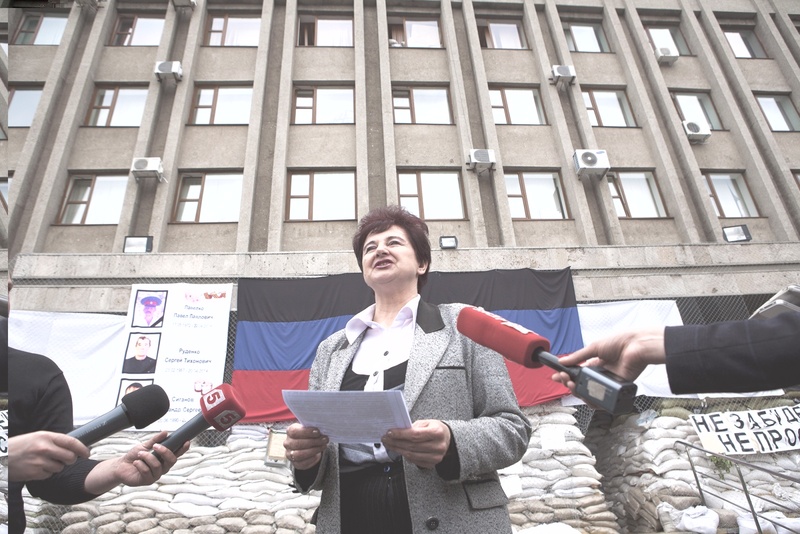 Behind her, the flag of the Autonomous Republic of Donetsk. On 9 May is the anniversary of the victory of the Red Army in II World War. After a rally in Lenin Square and a procession through the streets of the city Viaceslav Ponomariov, the self-proclaimed mayor of the city, draws his gun from its holster and shoot. Together him, his bodyguards shots three times in the sky to honor the war victims. 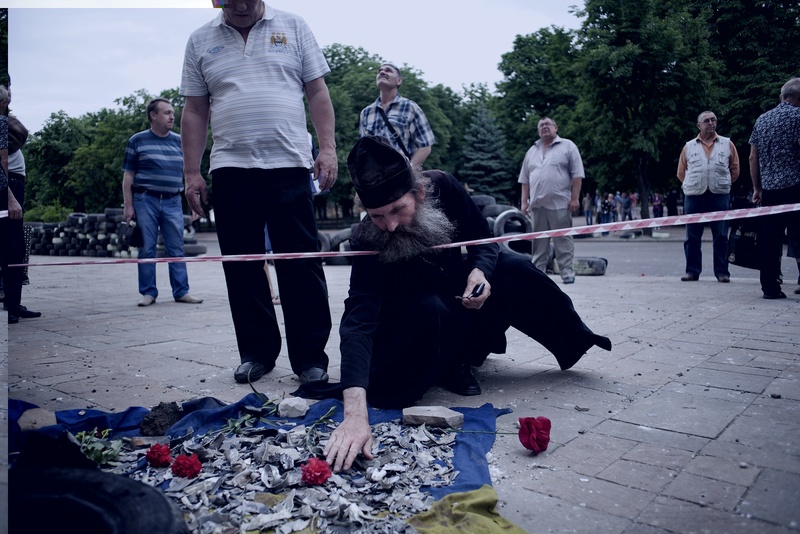 The day after a terrible air attack, an Orthodox priest touches some splinters placed, carefully, on a sheet lying at the foot of the municipal building of the city. Around him some fellow citizens observe in respectful silence the damage caused by the explosions, the blood stains and the flowers placed at the points where five people were killed and many were injured. 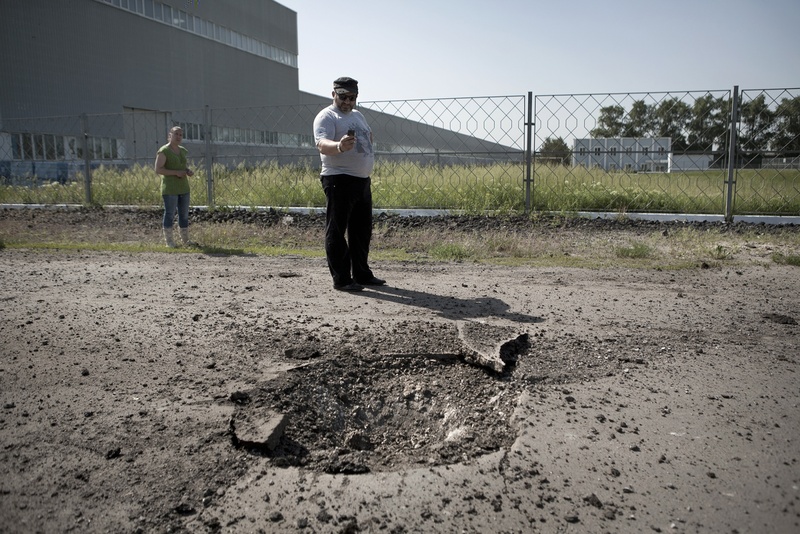 A foreigner is photographing a large crater caused by a mortar round fired in the night by government army near the “Zeus Ceramics” factory, owned Italian. The industry has been abandoned in April when started the hostilities between pro- Russian rebels and troops of Kiev. 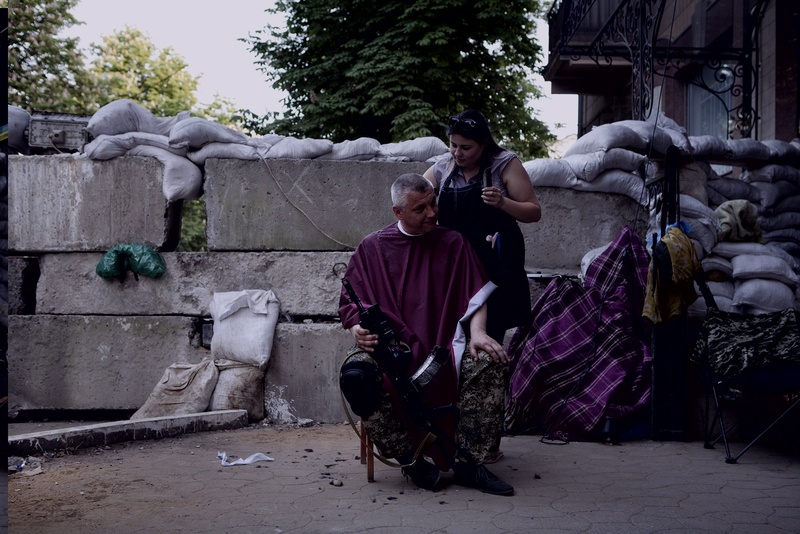 A hairdresser of the city has offered to look after the care of some rebels in the middle of Slavyansk. Her shop is closed for the war and she has free time. So, in a surreal atmosphere near Kalashnikovs and RPG hidden under a blanket squares, a separatist sits on a chair and relies on the expert hands of the girl. 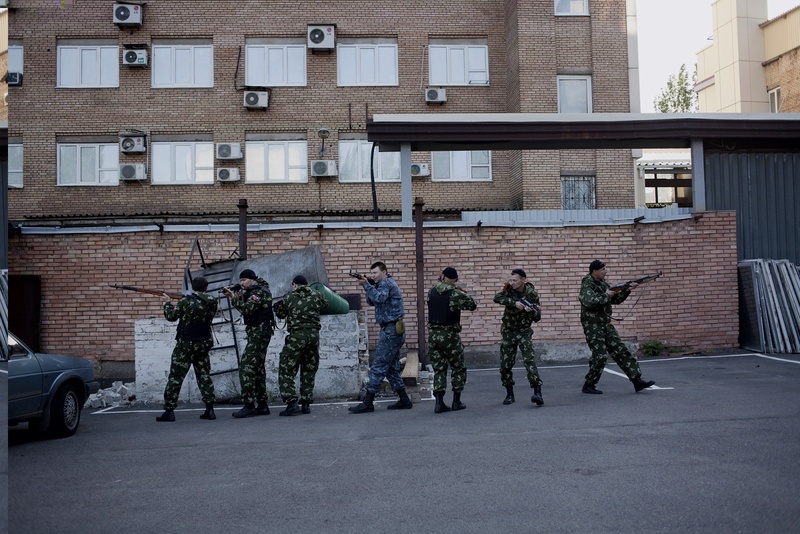 Most members of the Orthodox Russian Army are inexperienced and need a basic training. Many of them are young and they have never done military service. Others are older and out of practice. After a rudimentary lesson on the use of weapons, the trainers teach them how to move in patrol. Inside the base, in the center of the cour tyard and near a small religious chapel, it was set up a small shooting range.The walls were covered with leaden panels, illuminated by small spotlights and the shooting corridor is long 20 meters and divided into three stations. 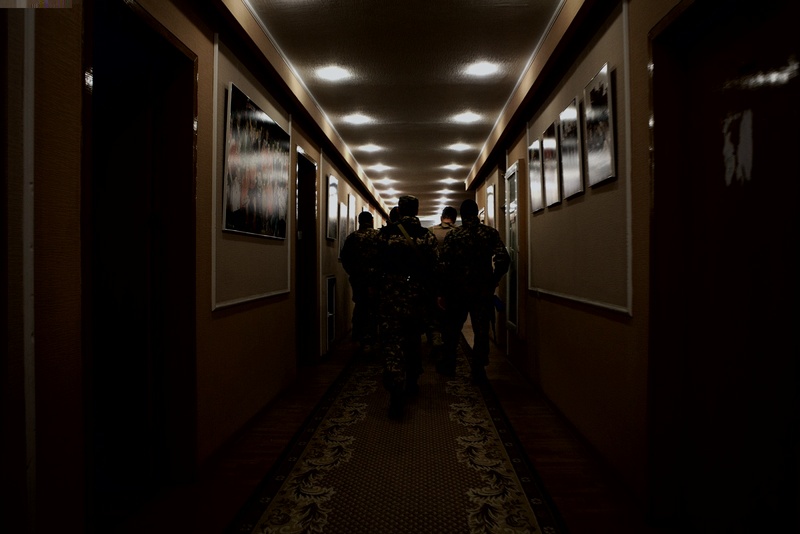 Some members of the Vostok battalion (a small Army of mercenaries allocated on the northern outskirts of the city) occupied the Rada, an important building previously occupied by the pro-Russian activists of Donetsk. Inside the palace they consume a frugal meal in the lobby of the building, used for about 2 months as refectory. 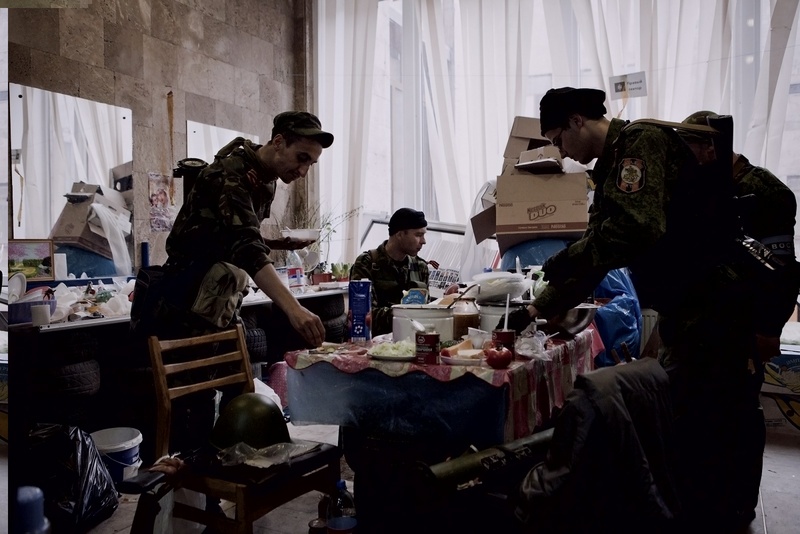 Inside the offices of the Ukrainian secret service have been set up sleeping quarters of the separatists soldiers. For each fighter is given a cot and some drawers to store their belongings. Each militiaman sleep with his weapons from which he should never separate. The sharpshooters or snipers are soldiers trained to hit targets at a distance, even to several hundred meters. Mostly use the Dragunov sniper rifle, of soviet production, semi-automatic and chambered for the 7.62 x 54 mm R. Unlike the regular armies in the Orthodox Russian Army they are present in all departments, not just in those specialized. Some pro-Russian militant having marched through the streets of the city and assaulting and brutally beaten pro- Ukraine protesters who gathered legally in the square in front of the autodrome of the city. 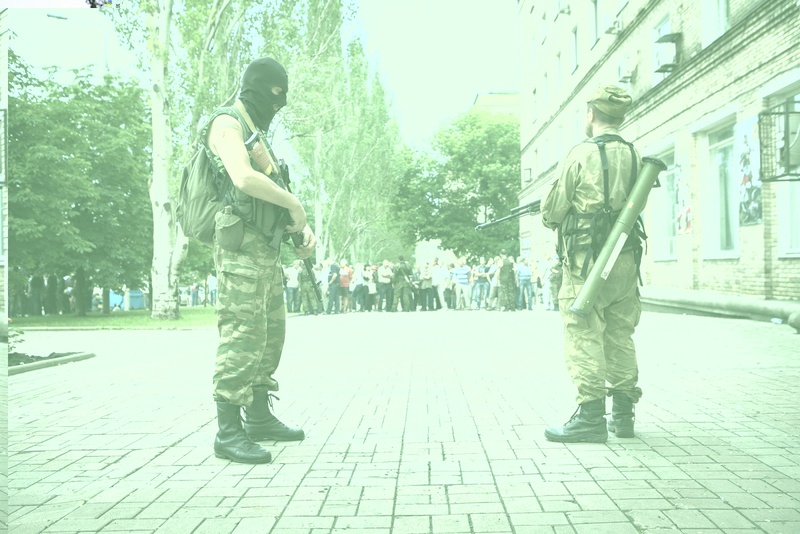 They patrol the Rada square, the Palace of the Regional Government of Donetsk. 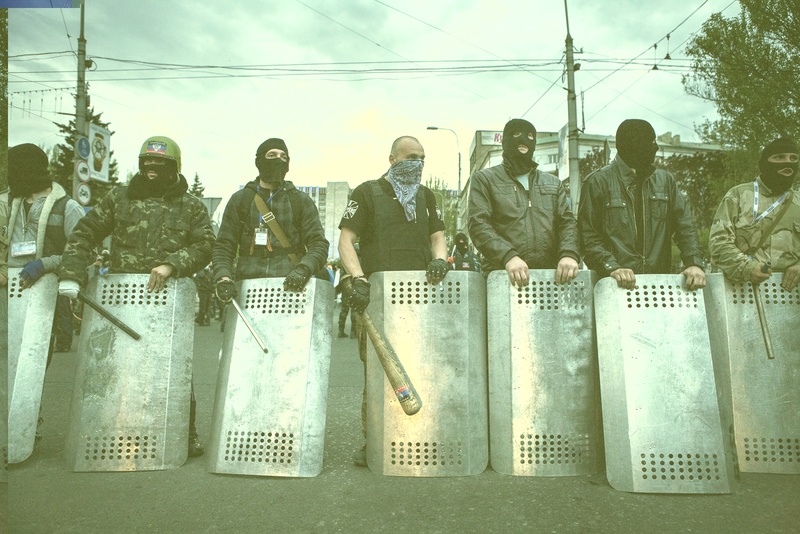 Their hands shake bats, sticks and shields supplied to the ukrainian police and stolen during the attack and occupation of the city attorney. Some separatists after the presentation at the press conference of the “Constitution” of the newly formed “Republic of Donetsk”. They are escor ting Denis Pushilin, the self-proclaimed governor of the Republic in the corridors of the Rada, the Palace of the Regional Government in the hands of the separatists for over three months. 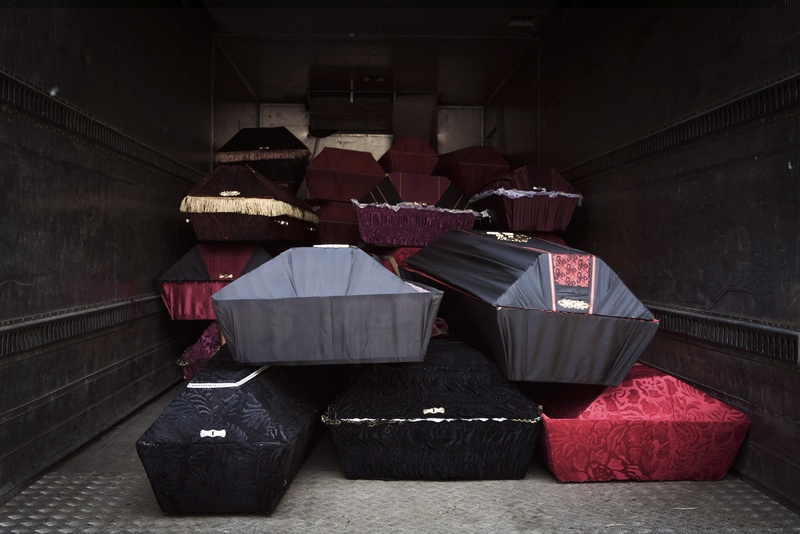 The coffins of 33 separatists died the day of the battle for the airport are loaded on a truck. They will consequently reported in Russia. Among the dozens of deaths of that day so even the 33 militiamen of the Vostok, explicitly declared “Russians” to public opinion. According to some rumors would be about 500 soldiers from Russia, Chechnya and Ossezzia recruited into the ranks of the Separatist Army. Battle name “Botsman”, born in 1982, unknown origin. Botsman is a pro-Russian rebel, speaks English very well and he arrived in Slavyansk in April, when the city passed under the control of the separatists. 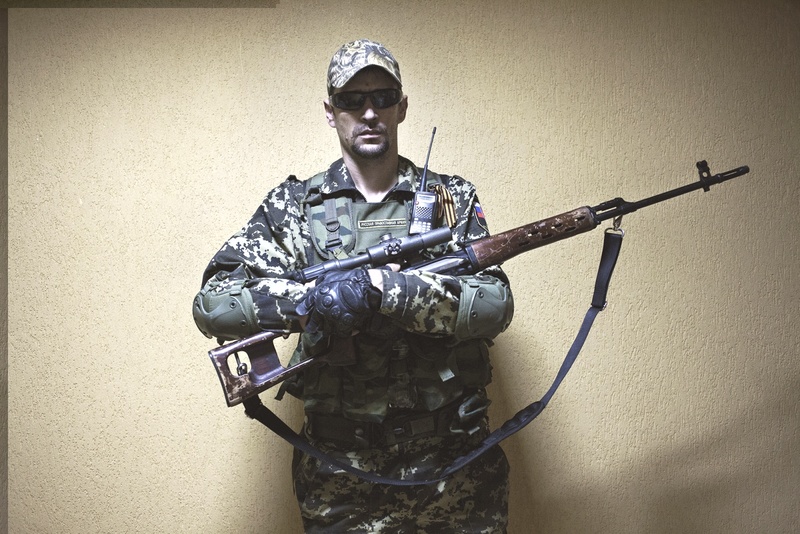 He is under the orders of the commander Arsen Pavlov, code name “Motorola”, in the battalion that has his name. 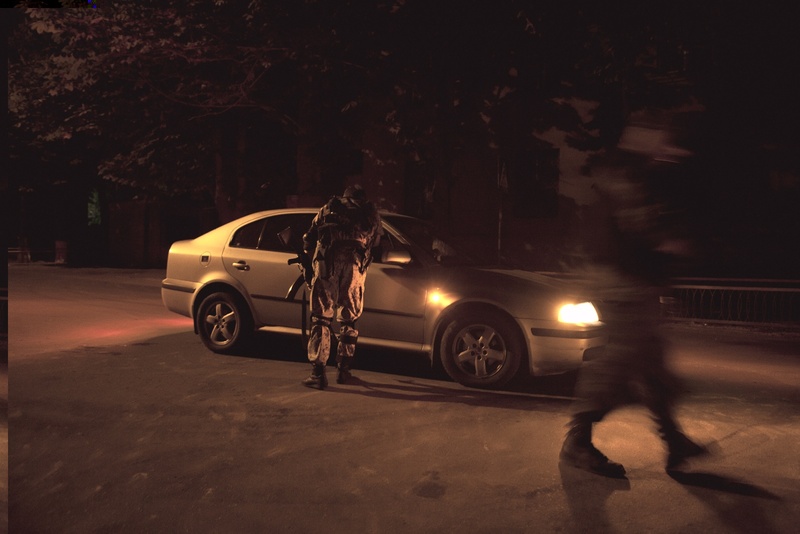 In the territories of the Autonomous Republic of Donetsk and particularly in the town of Slavyansk, the curfew is a form of social control. After eight p.m. is forbidden to move, either by car or on foot, as punishment the immediate arrest. Only for authorized vehicles and militians this ban is not mandatory and, after shown the permission, they are free to continue on their way. unaware of a new massacre. A weak and economically fragile country, kneeded by the collapse of the Soviet Union and ruled by an authoritarian political class supported by powerful oligarchs. This is a picture of Ukraine, a divided land actually in the heart of a crisis that could became global.The east part of the country is the closest to the history and russian culture and consequently the one more involved in their economically business. In this area it is already war: shootings on the streets and kidnappings, summary processes and executions, bombings and deaths. According to the last count 500 people are death and almost one hundred had disappeared. One faction is represented by Russian nationalists,Tsarist, communists, nostalgic USSR former and mercenaries. 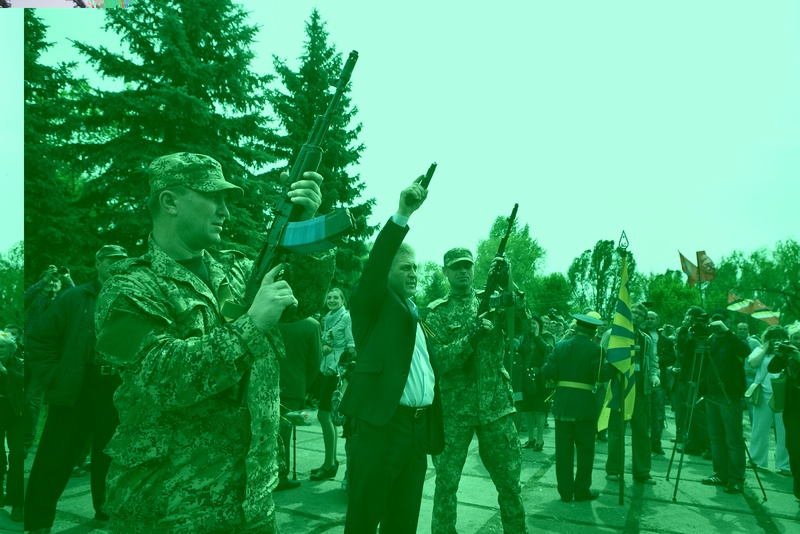 Ukrainian army and “National Guard”, formed mostly by Ukrainian nationalists, neo-fascist, neo-Nazis and member so fright-wing Parliamentary groups, form the other. Ukraine is a country strangled by the giants of the planet.They have firstly tied it into a billion-dollar business of the gas supplies and then imprisoned it in a geopolitical equilibrium too big to be sustained.As a result Ukraine is now collapsing into an ideological war without return.The Donetsk’s and Lugansk’s regions are the strong holds of the separatist movement, self- proclaimed “Federal State of Novorossiya”. In the area shootings happening every day and the new state begin to appear like a military dictatorship, ended up in the hands of the new lords of the war. 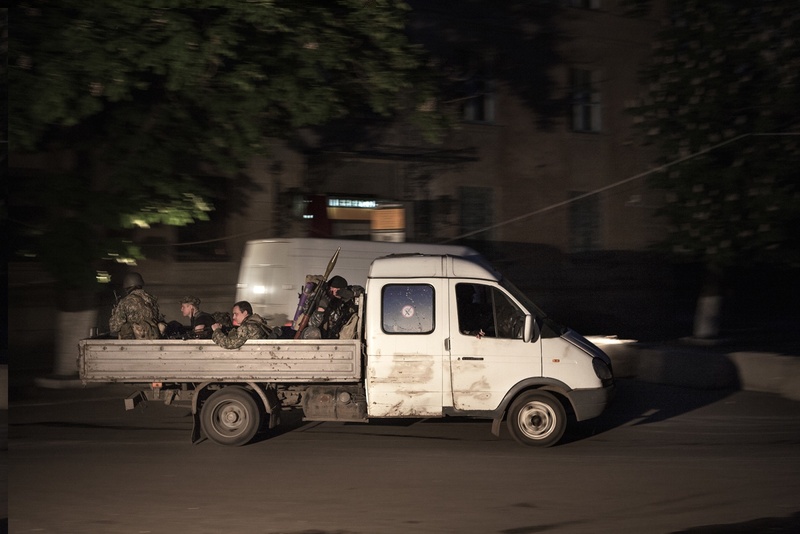 Sloviansk, that in the past became the symbolic city of the rebels, have been now released by ukraine regular army.The self- defense forces were patrolling the main roads of a block up city and were responding shot by shot to the enemy attacks. No humanitarian corridors are granted and civilian casualties are increasing steadly, such as the displaced persons. Since the begin of the conflict, about 34.600 people managed to escape from the repression of the new republics, from the poverty caused by the last crisis and from the bombs of the Government of Kiev.The capitol of Ukraine became famous as symbol of a popular pro-European movement, anti-russian and liberal, that born in order to get freedom and social equity. However in Donbass, this movement is currently staining himself even with the blood of the innocents that they were suppose to defend.